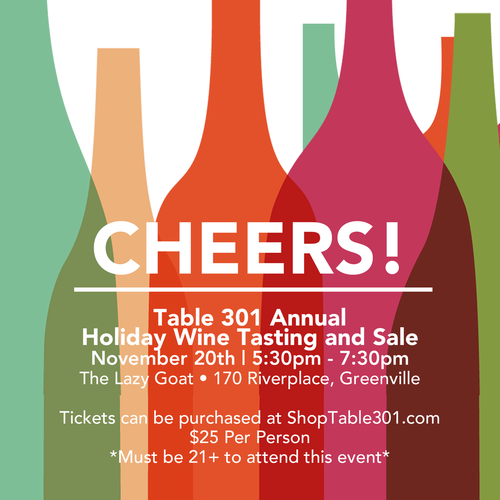 Join us at The Lazy Goat on Monday, November 20th, from 5:00pm – 7:00pm for our annual Holiday Wine Tasting and Sale. It's the perfect holiday event for wine lovers; whether you're looking for a holiday or client appreciation gift, wine for your next party, or simply to restock your own cellar, this is the place to be. More than 80 wines will be available to taste – representing a range of wine producing regions – with price points for all budgets. Rediscover old favorites and find some new ones! As always, we're pulling select wines from the cellars here at Table 301 to offer at great prices. As an added bonus this year, we’ll have a selection of gift baskets, gift-wrapping and “cash and carry” options to make holiday gift giving even easier. The Lazy Goat chef Steven Musolf and his culinary team will also have some complimentary light holiday bites to enjoy during the tasting. Tickets are $25 per person. Tickets are available online at ShopTable301.com* or you can secure your space by calling The Lazy Goat at 864-679-5299.